I did this in a hurry and the silver layer got bent. I hate it because it is generally a cute card. 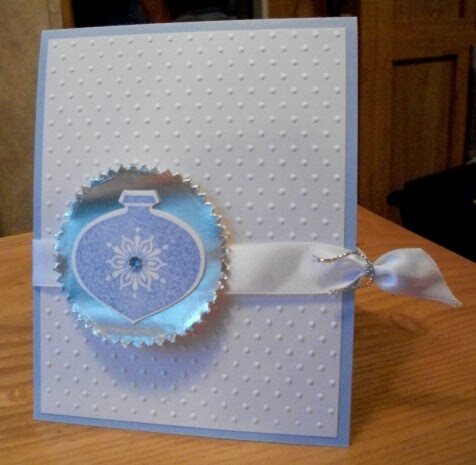 This challenge is to use blue and white with a bonus to use silver. Base card is Bashful Blue. A panel of white embossed Dotted Swiss was placed on the base. A piece of satin white ribbon was wrapped around the card base and tied with a piece of silver cord. The center of a 4" silver doily was cut out and a white circle was placed behind it to give it some stability. The silver piece was a tiny bit larger and since it was so thin it bent a little...grrrr!! An ornament was stamped in Bashful Blue and punched with the accompanying punch. A tiny light blue Kaiser Rhinestone was place din the middle.